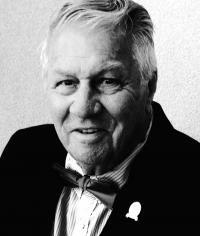 It is with great sadness and love that the family of Sidney Tjeerd Braaksma of Edmonton, Alberta, announces his passing on Tuesday, January 29, 2019, at the age of 75 years. He will be lovingly remembered by his wife of 53 years, Petranella; children, Annette (Todd) Tetz, Beverly Braaksma, Cheryl (Kevin) Watt; 7 grandchildren, Korinda (Dustin) Kostiw, Sid (Elena) Tetz, Chase Jenkinson, Saxon Jenkinson, Dillon Watt, Gavin Watt, Autumn Watt; 3 great-grandchildren, Austin Kostiw, Nikolai Tetz, Sidney Tetz. Sid is also survived by his siblings, Jacob “Jim” (Jenny) Braaksma, Corry (Tom) Vandermeer, Jelle (Debbie) Braaksma, and Bobby Braaksma. He is predeceased by his mother Korneliske “Korry” Triemstra-Braaksma and father Jelle Braaksma; sister Amy Braaksma, and his son Michael Alexander Braaksma. Sid was known by many as a successful entrepreneur in the Modular Building industry who took risks and worked tirelessly. Sid was a man of many interests he enjoyed traveling, was a Journeyman Machinist, a teacher, a classic car collector, a farmer, loved to buy and sell at auctions and fully restored the Magrath Mansion. He was strong in his convictions, devoted to supporting the community in various initiatives, quick to the aid of the less fortunate, a jovial witty man who easily made friends, loyal and compassionate. He was a loving husband, father, grandfather, great-grandfather, brother and uncle. He was a teacher to many and a friend to all. Sid was larger than life and left his mark on this world. The funeral service will take place at 1:00 p.m. on Saturday, February 9, 2019, at the West End Christian Reformed Church, 10015 – 149 Street NW, Edmonton, Alberta. Prior to the service there will be a viewing at West End Christian Reformed Church at 10:30 a.m. to 12:30 p.m. The Burial service (for family only) will follow at Westlawn Memorial Gardens. Fellowship following service at West End Christian Reformed Church. We pray that Sid is celebrating a life well lived with Jesus by the Juke Box. We will never forget him. In lieu of flowers, anyone wishing to make a donation in his memory is encouraged to donate to cancer research and clinical trials at The Cross Cancer Institute 11560 University Avenue, Edmonton, Alberta T6G 1Z2 or call 780-643-4400. The Family of Sid Braaksma requests that if you feel moved to share special memories or ways that Sid impacted you or your organization that you would consider emailing the story to [email protected] to be included in a special book to be passed down for generations.